Sealed and Safe Mouse Traps are pre-baited ready for use and give discreet mice trapping and killing. 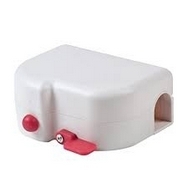 Simply turn the handle on the Sealed and Safe Mouse Trap to set the trap. The trapped mouse is hidden inside and not seen. These mousetraps are DISPOSABLE. When you have a mouse catch simply throw away the whole trap. Alternatively, if preferred, the trap can be emptied and re-used.